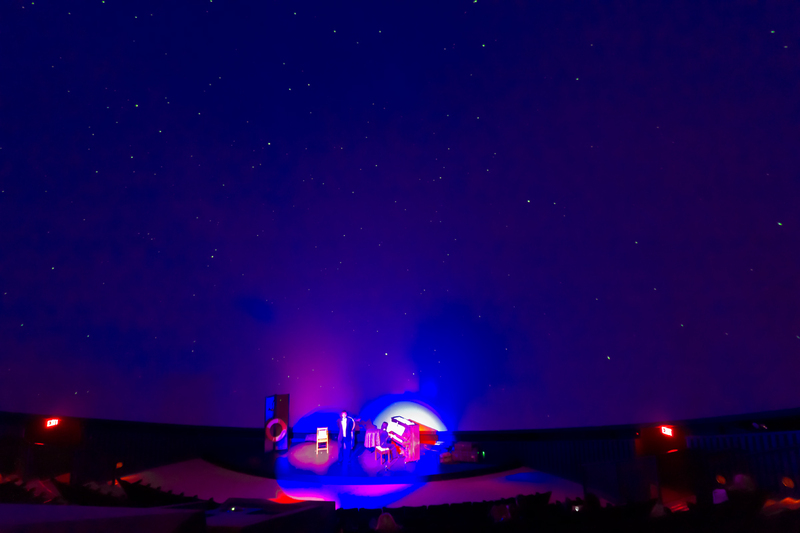 This isn’t really an astrophoto as such, but it certainly captures a special moment under the stars, in this case the artificial sky of the Discovery Dome planetarium theatre where I work. At the TELUS World of Science we currently have a wonderful exhibit featuring artifacts recovered from the wreck of the Titanic. To complement the exhibition, I’ve been organizing a series of evening special events, such as lectures and concerts. Here, performers from the Cantos Music Foundation in Calgary are performing some of the music the Titanic Band played on the ship’s fateful maiden voyage 99 years ago. “There was no Moon, and I have never seen the stars shine brighter. They appeared to stand out of the sky, sparkling like diamonds. It was the kind of night that made one feel glad to be alive.” — Jack Thayer, First Class Passenger. We set up the Digistar II to project the sky as it appeared on the night of April 14/15, 1912, and let it roll through the night from sunset to stop the stars as they were at about 2:30 am local time, when the ship disappeared, leaving only the lifeboats with about 700 survivors on the Atlantic under the cold night sky. It was a powerful moment, one of the best of my long career as a planetarium producer. One of the rules of astrophotography is that clouds always position themselves right over the objects you are trying to shoot. When the subject in question is a pair of planets, then a cloud will always cover one or the other planet, making it impossible to capture both at once and therefore record the conjunction. 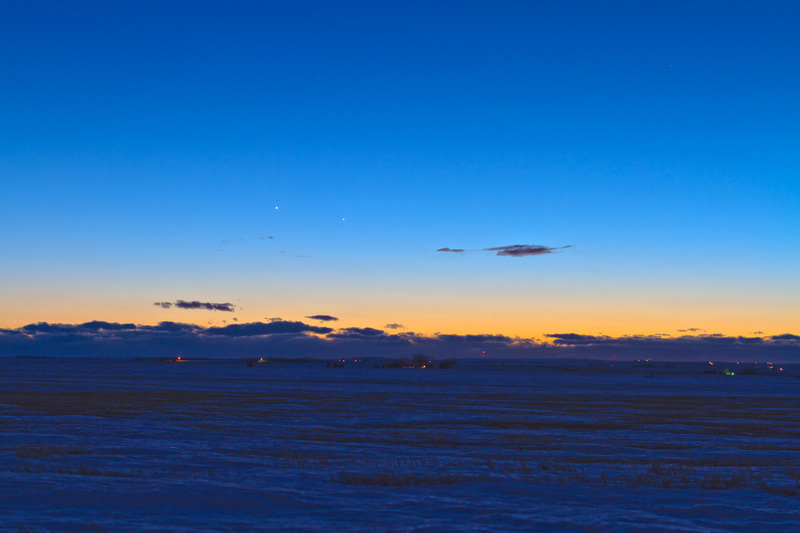 Tonight, March 15, I chased out west of Calgary to get the conjunction of Mercury and Jupiter over the scenic skyline of the Rockies. Of course, clouds drifted slo-0-0-0-w-ly across the sky. But with a little patience (and I do have very little to spare in situations like this!) I was able to catch a few moments when both Jupiter (at left here) and Mercury (upper right) shone in view amid the clouds. 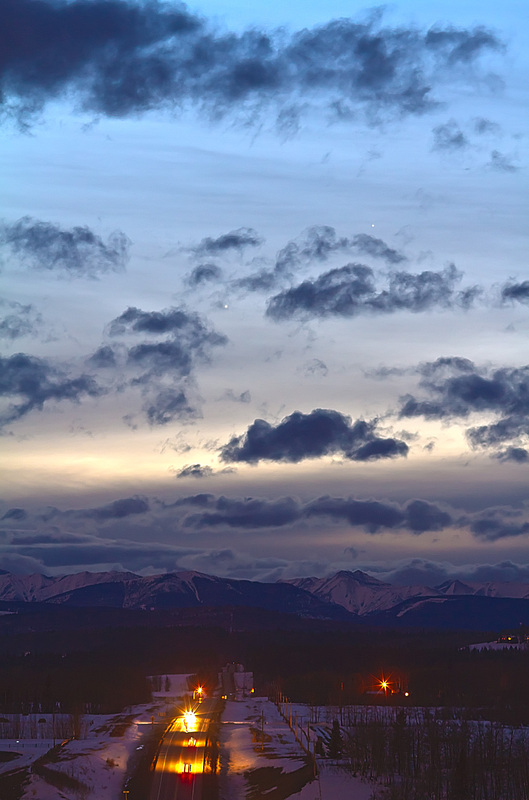 The highway (Highway 66 to Bragg Creek) adds a nice touch, with cars seeming to come and go from the distant planets. Again, as with the previous night’s shot, this is a “high dynamic range” stack of three shots taken in quick succession but with EV values 1 1/3rd f-stops apart, to retain both ground and sky detail in an inherently contrasty situation. Photoshop CS5’s HDR Pro feature does a great job. This is with the Canon 7D and 135mm lens. Visiting one of the world’s great observatories is always a highlight for any astronomy enthusiast. 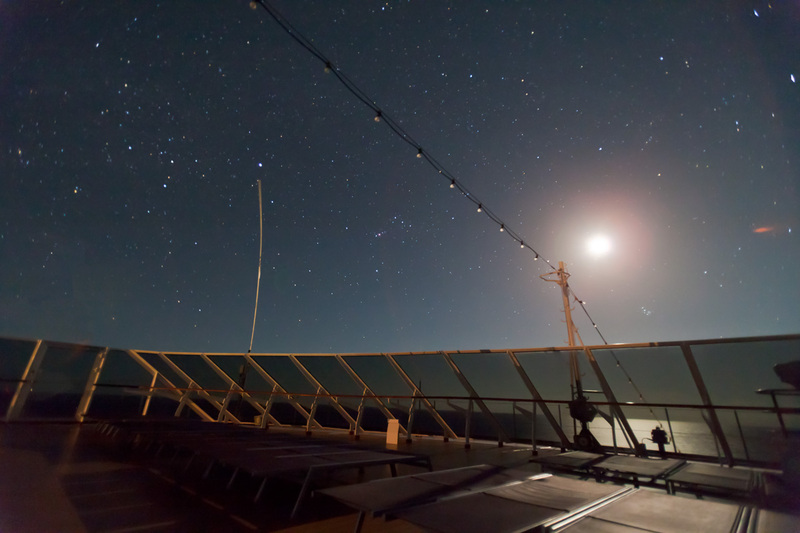 Most of us “collect” observatories, and try to get to as many as possible in our lifetime of travels and explorations. This last week provided me an opportunity to visit a place of legendary status in astronomy, the Arecibo Radio Observatory in Puerto Rico. This is the world’s largest single-dish radio telescope, and consists of a 1000-foot metal dish suspended in a natural bowl in the island landscape. 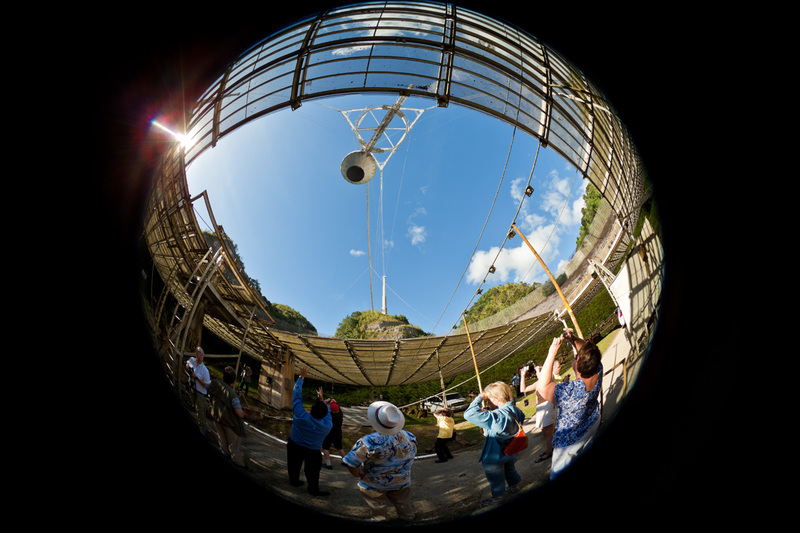 In this shot, our tour group, part of the “Cosmic Trails” Caribbean cruise I was on that week, is standing underneath the metal mesh dish, looking up toward the antennas suspended high above the dish. 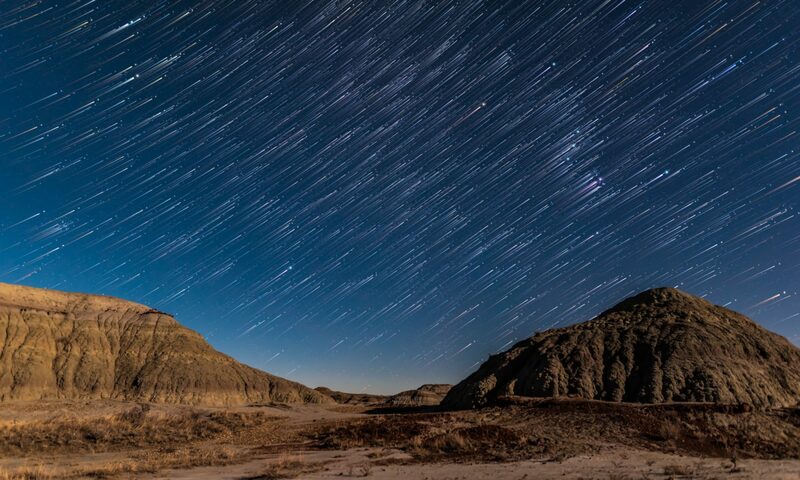 This is a rare and privileged place to stand — driving down into and under the dish isn’t on the usual tourist tour. Had they been beaming powerful radar signals out to some solar system target that afternoon we would not have been able to stand here. As it was, they were listing to signals from pulsars. We also got into the main control room to talk to the observers and technicians at work that afternoon. I won’t provide all the background about this remarkable observatory (you can read about it yourself at Wikipedia or visit the telescope’s webpage). However, movie fans will know this location from its appearance in the movie Contact and in the James Bond film Goldeneye. 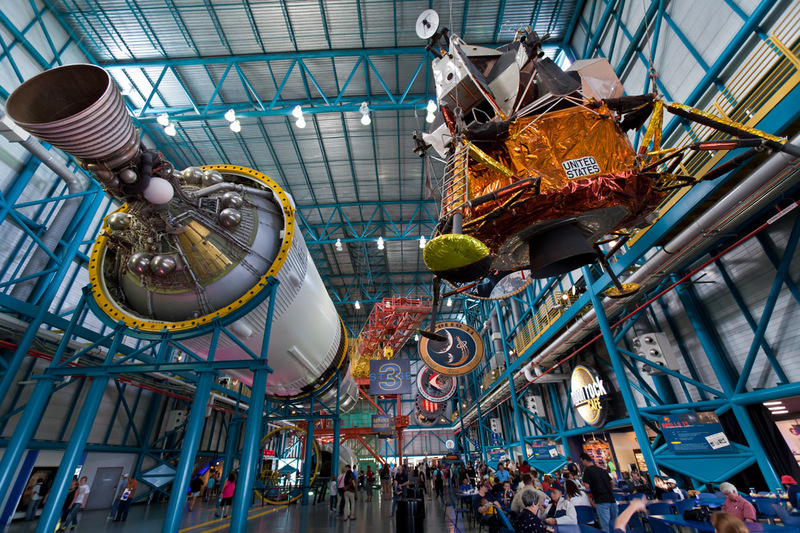 And it is well-known for its role in broadcasting signals to potential aliens and for listing to signals from extraterrestrials. However, one of its main roles these days is bouncing radar signals off passing near-Earth asteroids, and producing radar “images” of those asteroids. Arecibo also discovered, back in the 1960s, the true rotation rate of Mercury, now visible at its best in the evening sky.